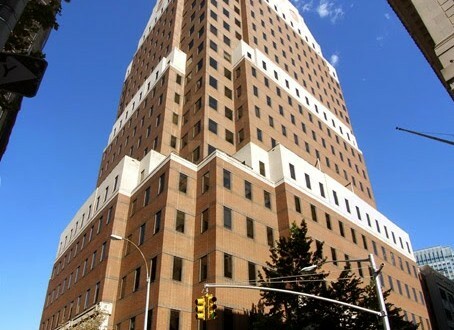 BROOKLYN: Hillary Clinton Campaign Signs Office Lease For 2016 Headquarters - Joe.My.God. The lease is signed: Hillary Clinton’s campaign headquarters will work out of 1 Pierrepont Plaza in Brooklyn Heights, according to a source familiar with the deal. The campaign will occupy two full floors of the office building, which is close to 12 subways lines and a dozen bus lines, and will be taking them as is – no buildout. On its website, the building markets it as “Modern Offices. Brooklyn Cool.” The Clinton team’s neighbors in the building will be Morgan Stanley and the office of the U.S. attorney for the Eastern District of New York. The clock on Clinton’s official announcement is now officially ticking. FEC rules state that you have 15 days between conducting campaign activities and filing a campaign committee.